How Common is Mobile Malware? Verizon, in its annual Data Breach Investigation Report (DBIR) considers malware that does more than just annoy you with unwanted ads to be “high-level” and counts it towards that 0.03 percent. (Counting all “unwanted software,” Verizon’s DBIR partner Kindsigh Security Labs came up with 0.68%, more than 22 times the “high-level” infection rate.) The sample population is “tens of millions” of Verizon Wireless users. When it comes to operating systems, Android is virtually the exclusive target of malware that Verizon found. The DBIR says that most of the attacks on iOS (iPhone and iPad) devices in its study turned out to be Android malware that picked the wrong target and failed. FireEye, a security research firm and one of the DBIR’s contributors, studied 7 million mobile apps on iOS and Android during 2014. Ninety-six percent of malicious mobile apps targeted Android, they found. Golfers, campers, and other outdoorsy types are more likely to be hit by lightning, and Android users are more likely to catch malware than iOS users. Still, the average rate of infections on both platforms is just 0.03 percent, or 0.68 percent if adware really annoys you. Adware is often spyware, too, notes FireEye, collecting personal information from the user (often with the user’s cooperation!) and delivering it to who-knows-who. This observation seems to have escaped the Verizon authors of the DBIR. Advertising is an increasingly favorite way for app developers to pay their bills; FireEye says adware-laden apps increased from 300,000 in 2013 to 410,000 in the first three quarters of 2014. Mobile malware, like the mayfly, is extremely short-lived, the DBIR reports. Four out of five new malware species vanish from the mobile ecosystem after just a week, while 95 percent survive no more than a month. A never-ending torrent of new malware variants enters the wild simultaneously, keeping anti-malware software on its toes. Where Does Mobile Malware Come From? One thing that bothers me about this report is that (like so many others that discuss malicious apps) it does not say whether the malicious apps came from the Google Play store, or some sketchy third-party app store. Downloading apps from the latter requires explicit permission from the user, and these third-party app sources are notorious for not policing submissions. Don't download from third-party app stores such as GetJar, where oversight is lacking or less stringent. If you're outside the USA, be aware that malware abounds in Chinese and Russian app markets. I stand by those recommendations, but if you feel that you need additional protection, AV-TEST has a list of mobile anti-malware apps, along with ratings and reviews. You'll find products from familiar security vendors there, including AVG, Avast, Avira, Bitdefender, Kaspersky and Norton. Most recent comments on "Mobile Malware: No Big Deal?" I've been using Lookout for years, but it wasn't tested in AV-Test. But now I am considering switching to one of the others (AVAST, CM). Is what I've heard about the FASHLIGHT app on both IOS and Android true? I've used Lookout since I got my first smartphone (paid plan--first by me, now still by me but through T-Mobile as part of the protection plan). I also don't use free apps. (Google Apps would be an exception.) Free apps and their ads are the worst thing for a phone. Slows them down and makes them vulnerable. I do use the Amazon App store, but not often. Installed AVG mobile on phone; nary a problem, ever. This is good info. Be aware, they're out to get you no matter what you do and they never quit as long as they can make the bck$$. 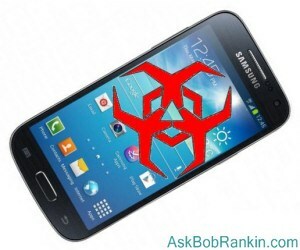 I have been fully aware, of the problems for the Android Smartphones, with malware, viruses and the like. I am using Avast! Mobile, now. When, I first learned of the malware and virus problems, on an Android Smartphone, I found a company called Qin, yes, that is how it is spelled. There was Lookout Mountain, but, Qin seemed to have more security and yes, this program is from China. Well, they upped the annual charge for Qin and that is when I saw, that Avast! finally, had a Mobile Anti-virus program. Boy, I jumped on that, quick like and downloaded the program. My Android Smartphone has been safe, with both programs. I have Malwarebyte and Bitdefender AV Free apps on my Android phone. Is android OS like Windows where they might conflict? and what is your opinion of these apps. I value your advice as always. EDITOR'S NOTE: As far as I konw, they will not conflict. But MBAM mobile doesn't seem to get very good reviews.